Court decisions have weakened Texas' open-government laws. Advocates hope that's addressed this year. Lawmakers in the House and Senate have filed bills that aim to address a pair of 2015 court decisions seen as threats to open government. Sarah Terrell was surprised to learn in 2016 that her son’s Houston high school was being renamed. In the span of one October week, it was announced — and then made official — that the High School for Performing and Visual Arts would now be called HSPVA Kinder, in honor of a local foundation that had donated $7.5 million to the school. Terrell was curious: How could that have happened so quickly? Did other schools handle renaming decisions the same way? So she filed an open-records request to see how the University of Houston had renamed three of its sports venues. But her attempt to learn more about how taxpayer-funded schools operate failed. After months of back-and-forth, she was denied all but one contract, and in the one she did receive, most of the information was redacted. In its decision to allow the University of Houston to keep the contracts hidden, Attorney General Ken Paxton’s office cited a 2015 Texas Supreme Court case known as Boeing Co. v. Paxton, which expanded what is considered a trade secret, or proprietary information of private companies that government agencies can withhold from the public. For years, advocates hailed Texas as a leader in government transparency. But now they say the Boeing ruling is just one example of a group of recent court decisions that have chipped away at the strength of the state’s open-government laws and made it harder for Texans to know what their government is up to. This year, lawmakers on both sides of the aisle are hoping to close some of the loopholes that the rulings have created. 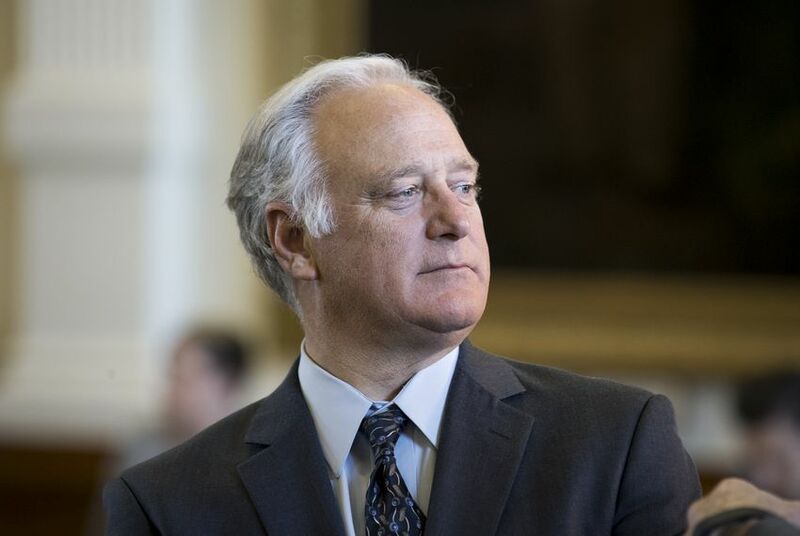 Sen. Kirk Watson, D-Austin, and Rep. Giovanni Capriglione, R-Southlake, filed Senate Bill 943 and House Bill 2189, companion bills that aim to address the pair of court decisions seen as the greatest threats to open government — Boeing and the Greater Houston Partnership v. Paxton. Before the Boeing v. Paxton decision, records showing how private companies were doing business with the government could be kept confidential during an ongoing bidding process if the release of the information would hurt the government’s ability to get a good deal. After the bidding process was over, the records were public, giving voters a chance to scrutinize how their tax dollars were being spent. In the Boeing case, a former Boeing employee requested records regarding a lease between the aerospace manufacturer and the Port Authority of San Antonio. But Boeing wanted to withhold some of the information. Eventually the case made its way to the Texas Supreme Court, which agreed with Boeing and ordered the state to block the release of the information. The court’s decision expanded the competitive-bidding exception in two ways, experts say. One, it allowed private companies to claim the trade-secrets exception when the government informs them that someone has requested information. And two, it lowered the threshold for what records could be kept secret by letting companies use the exception if they could say the release of information would put them at a competitive disadvantage in the future. And the companies are taken at their word; there is no mechanism for the attorney general to conduct independent fact-finding about whether disclosure would genuinely risk a competitive disadvantage. Prather said the Boeing decision can hurt small businesses. Without being able to see the winning contract, she said, companies that lose bids won’t know how to be more competitive in future deals, which could discourage competition. But for citizens, she said, the Boeing loophole leaves taxpayers unable to serve as a check on local governments. “When we think about all the economic development incentives that go out there, and companies say, ‘We're going to provide 50,000 jobs and we're going to do X, Y and Z for the community,’ you can no longer check to see if they're going to do those things because you can't get that information,” Prather said. Since the 2015 ruling, the attorney general’s office has cited the Boeing decision in withholding information in more than 2,600 public-records requests, said Kelley Shannon, executive director of the Freedom of Information Foundation of Texas. One now-infamous case occurred in McAllen, Texas, when the city paid pop singer Enrique Iglesias to perform at a 2015 holiday parade. Word got out that the city had lost money on the deal, but taxpayers to this day cannot find out how much the city paid Iglesias. Rep. Terry Canales, D-Edinburg, filed House Bill 81, a smaller version of the bills filed by Capriglione and Watson, which aims to prevent cases like the McAllen concert. The bill would prevent government entities from withholding information about the use of public funds for entertainment events. It passed unanimously out of the House last week and will now head to the Senate for consideration. Its companion bill, Senate Bill 402 — filed by Sen. Juan “Chuy” Hinojosa, D-McAllen — has yet to get a public hearing. But advocates say the bill is only a small fix to the Boeing loophole. At a House Committee on State Affairs hearing last week, which included testimony on HB 2189, Capriglione said while his bill would make the competitive-bidding exemption only applicable to the government, as did the original interpretation of the law, it’s not meant to restore the Texas Public Information Act to what it was before the 2015 ruling. He said his bill makes exceptions for contractors’ proprietary information while also allowing the public to get fundamental information in contracts like the terms, cost and information that would let the public know a company delivered what it promised. “This bill restores transparency to state and local government contracting while recognizing that some information is truly proprietary and does need to be protected from disclosure in order to foster competition,” Capriglione said at the hearing. An updated version of his bill would prevent line-item pricing from being withheld from contracts under the competitive-bidding exception. Larsen said the line-item provision is key. Without it, he said, the bill would do little to address problems created by the Boeing decision. In Greater Houston Partnership v. Paxton, the other case that advocates consider a major blow to transparency laws, a Houston resident requested a copy of the check register of Greater Houston Partnership, a nonprofit that provides economic development services to the city. GHP did not disclose the information, claiming that because public funds made up less than 8 percent of its total revenue, it did not qualify as a governmental entity and was not subject to the state’s open-records laws. The Texas Supreme Court agreed with GHP in 2015 and said the nonprofit didn’t have to disclose its financial records because it was not “sustained” by public funds, only supported by them. Essentially, the court said businesses that receive public money don’t have to make their information public unless they could not function without the funds. Advocates say the decision has limited what information quasi-governmental agencies have to keep open to the public. With that ruling, private companies can hide how they are spending public money and what taxpayer-funded incentives they offer to businesses. Capriglione’s bill would require companies that receive 60 percent or more of their funds from a governmental entity to respond to public records requests directly. “If government money is flowing out to nonprofits that are doing an extensive amount of government work, or essentially acting as an arm of the government, we ought to be able to see how that money is spent,” Shannon said. Additional bills have been filed that aim to address other loopholes advocates and lawmakers say exist in the Texas Public Information Act. House Bill 1655, filed by Rep. Todd Hunter, R-Corpus Christi, would require the government to include birthdates in public records, which would close a loophole created by a 2010 court decision that allowed the government to withhold individuals' birthdates when releasing information. Since that ruling, birthdates have slowly been “disappearing” from public records, Shannon said, affecting the media’s ability to identify individuals and people’s ability to do things like get same-day auto loans or finance a house. Hunter also filed House Bill 1700, which would require government officials to back up or forward public information from their private devices to a governmental server, and lays out requirements for how government officials should comply with requests for information on their private devices. And companion bills filed in the House and Senate — House Bill 3402 by Rep. Dade Phelan, R-Beaumont, and Senate Bill 1640 by Watson, aim to address a decision made by the Texas Court of Criminal Appeals last month. The decision struck down a more than two-decades-long provision of the Texas Open Meetings Act that made it a crime for public officials meet in a “walking quorum,” or to deliberate privately in small groups without a quorum present. "We simply couldn't let this ruling go unanswered," Watson said in a statement earlier this month. "Without some kind of walking quorum prohibition, there's nothing to stop government actors from meeting in smaller groups to avoid the spirit and intent of the Open Meetings Act." Last week, the House Committee on State Affairs heard testimony on a number of open-government bills, including the bills filed by Hunter and Capriglione. Of over a dozen advocates who testified, the majority were in favor of the three pieces of legislation. But there was some opposition from contractors to Capriglione’s Boeing bill. Tracy Schieffer, who represented the Associated General Contractors of Texas, said Capriglione’s bill would put an unnecessary burden on smaller companies that contract with the government. “[Making government agencies turn over businesses’ records] would make it necessary for many private companies that contract with governmental entities to hire legal counsel and additional staff to handle these incoming PIA requests and deadlines, as well as confidential government information,” Schieffer said. After the hearing, Capriglione said it’s “common sense” that companies doing business with the government should make their records public. The Senate Business and Commerce Committee will hear public testimony on Watson’s version of the Boeing bill this week. Watson and Capriglione each filed similar bills last session. Capriglione’s bills never made it out of a House committee. The Senate approved both of Watson’s bills, but Gary Elkins, who then chaired the House Government Transparency and Operation Committee, never gave it a hearing. But Elkins lost his bid for re-election in 2018, and the bills have been assigned to different committees. This year, the lawmakers say they have a new strategy: close the Boeing and GHP loopholes in one piece of legislation while compromising with the private contractors opposed to the bill last session. "Last session, a bipartisan coalition came together to close loopholes that these two rulings created, but we were stonewalled by a committee chairman who refused to give the bills a vote," Watson said in a statement when the bills were filed. "This session we're coming back with an even larger and more diverse coalition with a proposal that protects businesses' proprietary information without sacrificing the public's right to know how their tax dollars are spent." Advocates are hopeful that with this new strategy and different committee assignment, the bills will go further. “Rep. Phelan is the chair, and he's the one who filed that bill to update the open-meetings act, which is a real positive sign. It’s a different committee with a little bit more open-mindedness,” Shannon said. Disclosure: The University of Houston and the Boeing Co. have been financial supporters of The Texas Tribune, a nonprofit, nonpartisan news organization that is funded in part by donations from members, foundations and corporate sponsors. Financial supporters play no role in the Tribune's journalism. Find a complete list of them here. Texas' highest criminal court strikes down provision of Open Meetings Act as "unconstitutionally vague"